Recent reports indicate that B lymphocyte-induced maturation protein 1 (BLIMP-1), encoded by the Prdm1 gene, expands its control over T cells and is associated with susceptibility to colitis in mice with T cell-specific BLIMP-1 deficiency. In this study, we aimed to investigate the potential role of BLIMP-1 in regulating autoimmune diabetes and T helper type 17 (Th17) cells. We generated T cell-specific Blimp1 (also known as Prdm1) transgenic (Tg) or conditional knockout (CKO) NOD mice, in which Blimp1 is overexpressed or deleted in T cells, respectively. By side-by-side analysing these Tg or CKO mice, we further dissected the potential mechanisms of BLIMP-1-mediated modulation on autoimmune diabetes. Overproduction of BLIMP-1 in T cells significantly attenuated insulitis and the incidence of diabetes in NOD mice. Consistent with these results, the diabetogenic effect of splenocytes was remarkably impaired in Blimp1 Tg mice. Moreover, overproduction of BLIMP-1 repressed the proliferation and activation of lymphocytes and enhanced the function of regulatory T cells (Tregs) in NOD mice. In contrast, mice lacking BLIMP-1 in T cells markedly increased Th1 and Th17 cells, and developed highly proliferative and activated lymphocytes. Strikingly, overexpansion of Th1 and Th17 cells in CKO mice was significantly reduced by introducing a Blimp1 transgene, reinforcing the emerging role of BLIMP-1 in autoimmunity. We conclude that BLIMP-1 orchestrates a T cell-specific modulation of autoimmunity by affecting lymphocyte proliferation and activation, Th1 and Th17 cell differentiation, and Treg function. Our results provide a theoretical basis for developing BLIMP-1-manipulated therapies for autoimmune diabetes. The online version of this article (doi: 10.1007/s00125-012-2722-y) contains peer-reviewed but unedited supplementary material, which is available to authorised users. B lymphocyte-induced maturation protein 1 (BLIMP-1), encoded by the Prdm1 gene, is a transcriptional repressor that acts as an intrinsic master regulator in the terminal differentiation of B cells into plasma cells by antagonistic suppression of the c-myc, Bcl6 and Pax5 genes [1, 2, 3, 4]. BLIMP-1 also has a role in the control of T cells, including attenuation of T-helper type 1 (Th1) cells [5, 6, 7], downregulation of IL-2 in CD4+ cells  and control of the development and suppressive function of regulatory T cells (Tregs) . Although accumulating data indicate the critical roles of BLIMP-1 in T cell function [10, 11], the physiological regulation of BLIMP-1 in autoimmune diabetes remains unclear. Development of autoimmunity is highly associated with dysfunction of Th subsets. Th cells are divided into Th1, Th2, Th17, Treg and follicular Th cells. Transcription factors including STAT1, STAT4 and T-BET (encoded by the Tbx21 gene) and cytokines such as IFN-γ, IL-12 and IL-27 have been shown to control Th1 differentiation . Transcription factors including STAT3, RORα (encoded by the Rora gene) and RORγt (encoded by the Rorc gene) and cytokines such as IL-6, TGF-β, IL-21 and IL-23 have been demonstrated to induce differentiation of the Th17 cells that produce IL-17A, IL-17F, IL-21 and IL-22, and express Il23r . The transcription factor FOXP3 and TGF-β have been reported to be involved in differentiation of the Tregs that make TGF-β and IL-10 . Both Th1 and Th17 cells critically affect the elimination of pathogens during host defence responses. However, they promote excessive tissue inflammation in autoimmune diseases, such as type 1 diabetes [15, 16], whereas Tregs prevent autoimmune diseases through the maintenance of peripheral tolerance . Mice harbouring BLIMP-1-deficient T cells spontaneously develop severe colitis [5, 6], but the underlying cellular and molecular mechanisms in these mice are poorly understood. The axis of Th17 cells plus intestinal IL-23 has been demonstrated to orchestrate a colitogenic repertoire that induces colitis . Thus, the cooperation between extrinsic cytokines and intrinsic transcription factors in the control of colitogenic Th17 cells is critical in colitis. Interestingly, in these BLIMP-1-deficient mice, Th1 and Treg functions have been suggested to be tightly associated with the colitis [5, 6]. Nevertheless, the modulating effect of BLIMP-1 in the control of Th17 cells and autoimmune diabetes remains unknown. To investigate this issue, we generated Blimp-1 (also known as Prdm1) transgenic (Tg) NOD mice with the transgene under Lck proximal promoter and conditional knockout (CKO) mice lacking BLIMP-1 in T cells by a Cre–loxP deletion system. NOD mice spontaneously develop autoimmune diabetes that is characterised by the progressive destruction of insulin-producing cells . These Tg or CKO mice were used to dissect the potential mechanisms of the modulatory effects of BLIMP-1 on type 1 diabetes. NOD/Sytwu (Kd, Db, Ld, I-Ag7, I-Enull) and NOD/severe combined immunodeficiency (SCID) mice were purchased from The Jackson Laboratory (Bar Harbor, ME, USA) and bred in the specific pathogen-free facility of the animal centre in the National Defense Medical Center in Taiwan, which is approved by the Association for Assessment and Accreditation of Laboratory Animal Care International. We established the Lck proximal promoter-driven BLIMP-1 or Cre Tg mice in a NOD genetic background, as described previously . To establish CKO NOD mice, we ‘backcrossed’ the C57BL/6 mice with the Prdm1 flox gene  into NOD mice for more than ten generations, and then crossed with Cre Tg NOD mice to generate T cell-specific Prdm1-knockout NOD mice. Using Chemstrips (Roche, Boehringer Mannheim, Indianapolis, IN, USA), we measured urine glucose concentration weekly or every other day. 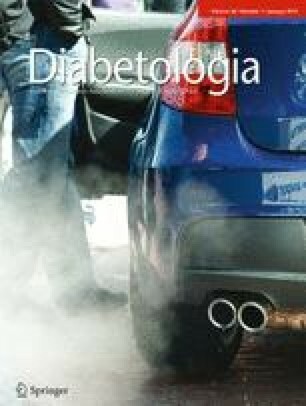 Diabetes was defined as glycosuria above 500 mg/dl on two consecutive tests. For histological analysis, pancreases removed from 12- to 14-week-old female mice were prepared as described previously . The severity of insulitis was scored blindly on sections stained with haematoxylin and eosin, as described previously [22, 23]. Thymocytes or CD4+ T cells isolated with mouse CD4 microbeads (Miltenyi Biotech, Bergisch Gladbach, Deutschland, Germany) were from 6- or 12-week-old mice, respectively. T cell cultures were performed as described previously . Splenocytes or CD4+CD25– effector T (Teff) cells from 12- to 14-week-old normoglycaemic female NOD donors, respectively, were prepared. Cells were then injected into female NOD/SCID recipients via the retro-orbital plexus, as described previously . CD4+ T cells were stimulated with plate-coated anti-CD3 (1 μg/ml) plus soluble anti-CD28 (1 μg/ml) monoclonal antibodies (mAbs) under Th0 or Th17 (IL-6, 10 ng/ml; TGF-β, 1 ng/ml; anti-IL-4, 10 μg/ml; anti-IFN-γ, 10 μg/ml) conditions for 3 days . Cells were stained with fluorochrome-conjugated antibodies specific for murine CD4 (RM4–5), CD69 (H1.2F3), IFN-γ (XMG1.2) (eBioscience, San Diego, CA, USA), CD25 (PC61) (BD Pharmingen, San Diego, CA, USA) and IL-17A (TC11–18H10.1) (BioLegend, San Diego, CA, USA). Flow cytometry was performed with a FACSCalibur (BD Pharmingen, San Jose, CA, USA). FlowJo software (Tree Star, Ashland, OR, USA) was used for data analysis. ELISAs for mouse IL-2, IFN-γ and IL-17 (R&D Systems, Minneapolis, MN, USA) were performed as described previously . Pancreas-infiltrating lymphocytes (PILs) were isolated as described previously . Lysates were subjected to 10% SDS-PAGE and immunoblotting was performed with antibodies for BLIMP-1 (3H2-E8; Novus Biologicals, Littleton, CO, USA) and β-actin (AC-15 clone, Sigma-Aldrich, St Louis, MO, USA). RNA was isolated (Qiagen, Valencia, LA, CA, USA) and used for cDNA synthesis with the SuperScript III synthesis kit (Invitrogen, Carlsbad, CA, USA) according to the manufacturer’s instructions. The primers used for quantitative RT-PCR with SYBR Green method are shown in the electronic supplementary material (ESM) Table 1. The logrank (Mantel–Cox) test was used for comparison of survival curves. Student’s unpaired t test was applied for statistical analysis of other experiments in this study. To investigate the hypothesis that BLIMP-1 may physiologically and/or pathogenically regulate T cells in autoimmune diseases, we generated Tg and CKO NOD mice with T cell-specific BLIMP-1 overproduction or ablation, respectively. A schematic diagram of the transgene is shown in ESM Fig. 1 a. To determine transgene expression and promoter stringency, we analysed the expression of transgene mRNA in various tissues from Tg mice. Tg Prdm1 was significantly expressed in the thymus, spleen, pancreatic lymph node (PLN) and mesenteric lymph node but was negative in bone marrow, indicating a T cell-specific stringency (ESM Fig. 1b). Western blot further revealed that BLIMP-1 is significantly more highly produced in thymocytes and CD4+ and CD8+ T cells from Tg mice than from controls (ESM Fig. 1c, d and Fig. 2), indicating an overproduction of BLIMP-1 in Tg T cells. In addition, we used the Cre–loxP system to generate CKO NOD mice lacking BLIMP-1 in their T cells without affecting its production in B cells (ESM Fig. 1 and Fig. 3). To investigate the modulatory role of Tg Blimp-1 in autoimmune diabetes, we examined the incidence of spontaneous diabetes in Tg mice. The incidence of diabetes was strikingly decreased in female Tg mice compared with controls (Fig. 1a). In male Tg mice, disease onset was slightly delayed and the incidence of diabetes was significantly reduced compared with controls (Fig. 1b). These results indicate for the first time a T cell-dependent protective role of BLIMP-1 in autoimmune disease. To further evaluate BLIMP-1-mediated immune modulation in mice, we analysed the severity of insulitis in Tg mice or controls . Representative sections of islets from 8- and 12-week-old mice are shown in Fig. 2a. Insulitis was attenuated in Tg mice, manifesting as more intact islets and fewer islets with severe infiltration (destructive insulitis), whereas in control mice islets with severe infiltration predominated (Fig. 2b). To further characterise the diabetogenic potential of lymphocytes in Tg mice, we performed an adoptive transfer . Onset of diabetes was delayed and disease incidence was markedly decreased in NOD/SCID recipients given Tg splenocytes or CD4+CD25– Teffs compared with those given control cells, respectively (Fig. 2c, d). Tg BLIMP-1-mediated attenuation of the diabetogenic effect of the lymphocytes apparently caused amelioration of the disease, further indicating that Tg BLIMP-1 orchestrates a T cell-specific immunological modulation and protects mice from autoimmune disease. Recently, it has been reported that BLIMP-1 deficiency in T cells is tightly associated with impaired T cell homeostasis, and that mice with BLIMP-1 deficiency have an increased susceptibility to colitis. To investigate the modulatory effect of BLIMP-1 on T cell homeostasis in a ‘gain-of-function’ or ‘loss-of-function’ manner, we evaluated the development of lymphocytes in the thymus, spleen and PLNs of Tg or CKO NOD mice at different ages. The total number of thymocytes was increased in 6-week-old Blimp-1 Tg mice and the number was markedly raised in CKO mice, compared with controls. Among them, the numbers of double-positive thymocytes in both Tg and CKO mice were significantly increased, compared with controls (ESM Fig. 4a). These results suggest that BLIMP-1 may have a complicated and stage-dependent modulatory effect on thymocyte survival and/or expansion. We further examined lymphocyte development in peripheral lymphoid organs, including the spleen and PLNs, in Tg and CKO mice. The absolute number of CD4+ T cells was significantly increased in the spleens of either 6- or 12-week-old Blimp-1 Tg mice compared with controls (ESM Fig. 4b). Similarly, a much higher number of splenic CD4+ T cells was observed in 6-week-old Blimp-1 CKO NOD mice. However, the number of splenic CD4+ T cells was only slightly increased in 12-week-old CKO mice compared with controls (ESM Fig. 4c). The absolute number of splenic CD8+ T cells was slightly decreased in 6-week-old CKO NOD mice and significantly diminished in 12-week-old Tg or CKO NOD mice, as compared with their controls. These results also suggest an age-dependent differential regulation of BLIMP-1 on the development of T cell subsets. Moreover, the number of lymphocytes in the PLN was dramatically decreased in 6- or 12-week-old Tg mice compared with controls. Among them, CD4, CD8 and CD19 populations were all decreased (ESM Fig. 4d, e). In contrast, the absolute number of lymphocytes in the PLN was strikingly increased in CKO mice at two different ages compared with controls (ESM Fig. 4d, e). Despite CD8+ cells from 12-week-old mice, populations including CD4+, CD8+ and CD19+ in the PLN at two ages were all increased in CKO mice compared with their controls (ESM Fig. 4d, e). This Tg BLIMP-1-mediated downregulation of T cells in the PLN might contribute to the protective phenotype in Tg mice. Since BLIMP-1-disrupted CD4+ T cells are hyperproliferative [5, 6], we investigated whether Tg BLIMP-1 modulates T cell proliferation. After stimulation through the T cell receptor (TCR) or with phorbol-12-myristate-13-acetate plus ionomycin, the proliferation of thymocytes was significantly impaired in Tg mice compared with controls (Fig. 3a). In contrast, it was dramatically enhanced in CKO mice compared with controls (Fig. 3b). These results demonstrate a suppressive role of BLIMP-1 in thymocyte proliferation. Similarly, proliferation of splenic CD4+ T cells in response to both types of stimulation was remarkably attenuated in Tg mice compared with controls (Fig. 3c). These results indicate an inhibitory function of BLIMP-1 on T cell proliferation in Tg mice. In contrast, in a carboxyfluorescein diacetate succinimidyl ester (CFSE)-based cell division assay, naive CD4+ T cells from CKO mice were highly proliferative, at a low or intermediate cell density, compared with controls after TCR-mediated stimulation (Fig. 3d). The downregulated proliferation of splenic CD4+ T cells may be the result of BLIMP-1-mediated suppression of IL-2 , since the production of this cytokine by stimulated CD4+ T cells from Tg mice was significantly decreased compared with controls (Fig. 3e). In contrast, IL-2 production was remarkably increased in CKO T cells (Fig. 3f). To further investigate the activation status of CD4+ T cells in Tg or CKO mice, we analysed the expression level of CD69. The percentage of CD69-positive CD4+ T cells was significantly decreased in freshly isolated spleens of Tg mice compared with controls (Fig. 3g). This low activation status with less IL-2 production is consistent with the poor proliferative potential of Tg CD4+ T cells. In contrast, the percentage of CD69+ cells was notably increased in CKO mice compared with controls (Fig. 3h). In addition, we further analysed the production ‘level’ of CD25 in CD4+ T cells to see whether it is relevant to the activation status of T cells. Six hours after stimulation with anti-CD3/CD28, the level of CD25 in CD25+CD69+CD4+ T cells was downregulated in control, Tg and CKO mice. Among them, the CD25 level in T cells from CKO mice was marginally higher than that of control or Tg mice (Fig. 3i), suggesting a higher or faster activation status in CKO CD4+ T cells upon TCR stimulation. Moreover, 16 h after stimulation, the CD25 level of CD25+CD69+CD4+ T cells from Tg mice was significantly lower than that in control mice (Fig. 3i). In contrast, CD25+CD69+CD4+ T cells from CKO mice produced much higher CD25 levels than control mice (Fig. 3i). At 24 h after stimulation, the lower CD25 or higher CD25 level was more significant in CD25+CD69+CD4+ T cells from Tg or CKO mice, respectively, compared with cells from control mice (Fig. 3i), suggesting that an attenuated or upregulated activation status after stimulation might reflect the IL-2 availability of Tg or CKO CD4+ T cells, respectively. These results suggest that BLIMP-1 critically modulates T cell activation and proliferation and affects the development of autoimmune diseases in a time-dependent and differential manner. Tregs are essential for maintaining tolerance in NOD mice . C57BL/6 mice with T cell-specific BLIMP-1 ablation develop severe colitis, possibly as a result of a defect in Tregs [6, 9]. To dissect the potential modulation of BLIMP-1 in Tregs and its subsequent effect on the autoimmune process in NOD mice, we performed an in vitro suppression assay. Proliferation of Teffs was significantly inhibited in the presence of Tregs from Tg mice compared with cells from controls (ESM Fig. 5a). Consistent with the result of the [3H]-methyl thymidine incorporation experiment, a CFSE-based proliferation assay indicated that cell division index of Teffs was markedly repressed in the presence of Tregs from Tg mice compared with cells from controls (ESM Fig. 5b). Both results indicate that Tg BLIMP-1 in Tregs provides an ‘additional’ suppressive effect on Teff proliferation. This result, consistent with a previous report , indicates an intrinsic defect of BLIMP-1-deficient Tregs manifested by an attenuated immunosuppressive function. A Th1 response is the predominant process in autoimmune diabetes of NOD mice . This lack of control over Th1 has been attributed to BLIMP-1 disruption in T cells [5, 6] through the abolition of BLIMP-1-mediated attenuation of Tbx21 and Ifng gene expressions . To investigate the suppressive effect of BLIMP-1 on Th1 cells in NOD mice, we determined the steady-state expression levels of Tbx21 and Ifng in splenic CD4+ T cells of non-diabetic (6-week-old) and prediabetic (12-week-old) Tg and CKO mice. Both Tbx21 and Ifng transcripts were significantly downregulated in Tg CD4+ T cells from either non-diabetic or prediabetic mice compared with controls (Fig. 4a, b), revealing Tg BLIMP-1-mediated suppression of expression of these genes. These results are supported by a previous report that BLIMP-1 can directly bind to a distal regulatory region of the Ifng gene and to multiple sites in the Tbx21 gene . In contrast, steady-state expression of both these genes was dramatically upregulated in CKO CD4+ cells from non-diabetic or prediabetic mice compared with controls (Fig. 4a, b), indicating that BLIMP-1 is an attenuator of Th1-specific genes. Our results further showed that the frequency of IFN-γ-producing Th1 cells was markedly increased in CKO mice (Fig. 4c) and significantly decreased in Tg mice (Fig. 4d) compared with controls. In addition, CKO CD4+ T cells secreted much more IFN-γ (Fig. 4e) and Tg T cells produced much lower amounts of IFN-γ (Fig. 4f) than controls. These results indicate that BLIMP-1 orchestrates attenuation of Th1 cell expansion through downregulation of Tbx21 and Ifng genes. It has been reported that Th17 cells act as a critical colitogenic mediator . Interestingly, C57BL/6 mice with T cell-specific BLIMP-1 ablation develop lethal colitis [5, 6]. To investigate whether BLIMP-1 deficiency modulates Th17 cells in the autoimmune diabetes of CKO NOD mice, we determined the steady-state or activated-state expression of Rora, Rorc, Il17a, Il17f, Il22 and Il23r in splenic CD4+ T cells of non-diabetic and prediabetic CKO and Tg mice. Expression levels of Rora and Rorc were prominently increased in CKO CD4+ T cells in a steady-state manner or under an activated status compared with controls (Fig. 5a, b), indicating a critical role of BLIMP-1 in the downregulation of Th17 cell-specific transcription factors in CD4+ T cells of NOD mice. In contrast, their transcripts were significantly downregulated in Tg CD4+ T cells in the same conditions compared with controls (Fig. 5a, b), revealing an ‘additional’ suppression provided by Tg BLIMP-1. In addition, expressions of Il17a, Il17f, Il22, and Il23r were promoted at much higher levels in CKO CD4+ T cells and were inhibited at significantly lower levels in Tg CD4+ T cells as compared with control cells, either in a steady-state manner or in a stimulated status (Fig. 5c–f). These results indicate that BLIMP-1 is a transcriptional attenuator of Th17 cells and its regulation is age-related and activation-dependent. In a Th17 polarised condition, the development of Th17 cells and mean fluorescence index of IL-17A in these cells are significantly suppressed in Tg splenic CD4+ T cells. In contrast, they are remarkably increased in CKO CD4+ T cells under the same condition (Fig. 6a–c), indicating an inhibitory function of BLIMP-1 in Th17 cell differentiation. Consistent with this observation, Tg CD4+ T cells produce much less IL-17 cytokine in either Th0 or Th17 conditions (Fig. 6d), whereas CKO CD4+ T cells secrete much more IL-17 cytokine (Fig. 6e), as compared with their controls. These results suggest that BLIMP-1 impedes Th17 function via Rora and Rorc downregulation and further support the hypothesis that BLIMP-1 ablation-mediated colitis is associated with the deregulation of Th17. Moreover, we further analysed the absolute numbers of Th1 and Th17 cells in PLNs or PILs among control, Blimp-1 Tg and CKO mice. The absolute number of Th1 or Th17 cells in PLNs from Blimp-1 Tg mice was significantly decreased, as compared with controls (Fig. 7a). In contrast, the absolute cell number of Th1 or Th17 cells was markedly increased in PLNs from Blimp-1 CKO mice, as compared with that from controls (Fig. 7a). Both results indicate an inhibitory role of BLIMP-1 in the development of Th1 or Th17 cells in NOD mice, reinforcing the emerging role of BLIMP-1 in protection against autoimmune diabetes. Similarly, the absolute number of Th1 or Th17 cells dramatically decreased in the PILs of Blimp-1 Tg mice, as compared with controls (Fig. 7b). Finally, the absolute number of Th1 or Th17 cells was remarkably increased in the PILs of Blimp-1 CKO mice, as compared with controls (Fig. 7b). These results further demonstrate a critical role of BLIMP-1 in the modulation of proinflammatory Th1 and/or Th17 cells in PLNs and PILs of NOD mice. To investigate the potential restoration of suppressive function of BLIMP-1 on Th1 and Th17 cells in CKO mice, we further introduced the Blimp-1 transgene in CKO mice, called CKO+Tg mice, which express Tg Blimp-1 in T cells without endogenous BLIMP-1 production. We analysed the frequencies of Th1 and Th17 cells in non-diabetic and prediabetic CKO+Tg mice, compared with age-matched controls, respectively. Our results reveal that at a young age, the frequencies of Th1 and Th17 cells were significantly attenuated in Tg mice, but highly increased in CKO mice (Fig. 8a–c). Strikingly, both cell types were remarkably suppressed at the same age in CKO+Tg mice, compared with CKO mice, indicating that the Blimp-1 transgene may rescue the abnormal induction of Th1 and Th17 cells in BLIMP-1-ablated mice. However, this Blimp-1 transgene-mediated restoration is less significant in older mice, suggesting that the Blimp-1 transgene is not sufficient to completely restore the inhibition of Th1 and Th17 cells. Our results suggest that Tg BLIMP-1 partially restores the inhibition of uncontrolled Th1 and Th17 cells of CKO mice. C57BL/6 mice with BLIMP-1 ablation develop severe colitis [5, 6], and a similar phenotype was observed in the current study in NOD mice with BLIMP-1 disruption. Unexpectedly, these BLIMP-1-deficient NOD mice manifested a mild insulitis and were completely resistant to diabetes, although the numbers of Th1 and/or Th17 cells were significantly increased in the PILs of CKO mice. Nevertheless, these CKO mice developed severe colitis at a young age, consistent with the phenotype presented in C57BL/6 mice with T cell-specific BLIMP-1 deficiency . Moreover, NOD/SCID mice adoptively transferred with splenocytes or CD4+CD25– Teffs from CKO donors were still completely resistant to diabetes, compared with recipients transferred with cells from control mice (data not shown). However, these CKO-cells-transferred NOD/SCID mice eventually developed severe colitis, mainly manifested as severe diarrhoea and loss of body weight. Although BLIMP-1-deficient T cells in NOD mice do not appear capable of diabetogenesis, they possess a colitogenic property and cause severe colitis, suggesting an organ-shifting autoimmunity of these CKO T cells in NOD mice. To further address the potential mechanism involved in this shift, we evaluated whether T cells with BLIMP-1 ablation affect thymocyte development. Our results indicate that the development of thymocytes in CKO mice is relatively normal, since they express similar maturation markers compared with controls. It has been reported that IL-23/Th17 axis plays a crucial role in the pathogenesis of colitis , consistent with our observations that Th17 cells are significantly increased in BLIMP-1 CKO mice and that CKO CD4+ T cells highly express IL-23R. In addition, it has been reported that Tregs maintain immunological tolerance over the pathogen-activated Teff function to achieve immunity or autoimmunity in intestinal mucosa. Dysfunctions in Tregs potentially disrupt the tolerance in intestinal mucosa and colitogenic processes eventually develop [9, 14]. Consistent with these reports, our observations indicate that Tregs manifest an attenuated suppressive function in Blimp-1 CKO mice. This may also contribute to the disease phenotype we observed: that Blimp-1CKO NOD mice are preferentially susceptible to colitis instead of diabetes. Nevertheless, the underlying mechanism(s) behind the lack of diabetogenesis in Blimp-1 CKO NOD mice remain unclear. More experiments are required using islet antigen-specific TCR-Tg and Blimp-1 CKO NOD mice to further dissect the underlying mechanism(s) for the diabetic resistance of Prdm1 CKO T cells. Th1 cells are significantly decreased in Tg and markedly increased in CKO NOD mice, indicating that BLIMP-1-mediated protection is tightly associated with downregulation of Th1 cells. Our results are consistent with previous reports that mice harbouring BLIMP-1-deficient T cells increase Th1-mediated inflammation [5, 6]. Furthermore, it has been reported that BLIMP-1 attenuates Th1 cells via the suppression of T-bet . T-bet-deficient mice are protected from autoimmune diabetes , indicating an essential role for T-bet in diabetogenesis. Because Th1 cells are predominant in diabetogenic processes, attenuation of the function of these cells leads to protection against autoimmune diabetes. Moreover, BLIMP-1 binds directly to regulatory elements in the Tbx21 or Ifng genes to attenuate their expression . Our results, indicating that Tg Blimp-1 additionally downregulates Tbx21 and Ifng expression, are consistent with this report. We demonstrate for the first time that BLIMP-1 negatively regulates Th17 differentiation via Rora and Rorc modulation. Regulation of Prdm1 is IL-21-dependent and is controlled by cooperation between STAT3 and interferon regulatory factor 4 (IRF4) . STAT3-deficient CD4+ T cells impair Th17 differentiation via RORα and RORγt downregulation . Similarly, IRF4-deficient mice lack Th17 differentiation . However, the role of Th17 cells in autoimmune diabetes remains controversial, because Th17 cells have been reported as either pathogenic or protective in this disease [16, 31]. Inhibition of Th17 cells suppresses autoimmune diabetes in NOD mice [25, 32, 33, 34], suggesting a pathogenic role for Th17 cells in NOD mice. Our results are consistent with these reports, demonstrating a novel role for BLIMP-1 in the downregulation of Th17 in Tg NOD mice. In summary, we demonstrate a previously unknown function of BLIMP-1 in the attenuation of Th17 cells and a protective role of BLIMP-1 in autoimmune diabetes. We are grateful to K. Calame (Department of Microbiology and Immunology, Columbia University College of Physicians and Surgeons) for C57BL/6 mice harbouring a loxP-flanking Blimp-1 knock-in allele, to M.-Z. Lai (Institute of Molecular Biology, Academia Sinica, Taipei, Taiwan) for plasmid DNA containing Lck proximal promoter elements and to S.-C. Miaw (Graduate Institute of Immunology, College of Medicine, National Taiwan University, Taipei, Taiwan) for raising some constructive suggestions and providing technical assistance in this project. This work was supported by the National Science Council, Taiwan, ROC (NSC99-2320-B-016-001-MY3 and NSC100-3112-B-016-001), the Tri-Service General Hospital foundation (TSGH-C100-127 and TSGH-C101–009-S01) and the National Health Research Institutes (NHRI-100A1-PDCO-0809111), and in part by the C.Y. Foundation for Advancement of Education, Sciences, and Medicine. M-HL, F-CC, L-TY, S-HF, H-YCC, K-IL, D-MC and H-KS made substantial contribution to study conception and design. M-HL, L-TY, S-HF and H-YCC acquired the data. M-HL and H-KS performed the analysis and interpretation of data. M-HL, F-CC, L-TY, S-HF, H-YCC, K-IL, D-MC and H-KS drafted the article and revised it critically for important intellectual content. All authors approved the final version of the manuscript to be published.